A warm waterproof breathable cowhide police biker gloves. This gloves is also called the all weather gloves. 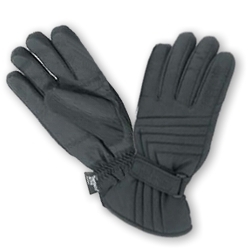 It has the thermal insulation and warm lining to keep the hand hot during the winter. A good looking style and generally wear by police officer. The full cowhide leather outer shell feature and enhanced up wrist style. And a velcro closer for perfect fitting. o Double palm having great control.